Home / Contests / Drobo Giveaway! August 18, 2011 By Mark Z. In case you didn’t win during the first Drobo Giveaway at GeekBeat.TV, we’re giving you yet another chance to win one! We’ll also be giving away more during the upcoming weeks so make sure you’re paying attention to John and Cali on Twitter, Google+, Facebook, etc! UPDATE: This giveaway is OVER! The first entry is required!. Simply fill-out and submit the form found HERE. Done! You’re entered! Easy, right? For a THIRD chance to win, post your comment below and tell us why you need a Drobo! Keep in mind that some comments get marked as spam. Don’t worry, we’re checking things routinely so no need to re-submit your comment multiple times. Keep ’em coming! Doing one of the above will get you an entry for the giveaway. Do all 3 and you are entered 3 times! Good luck! UPDATE: This giveaway is OVER! Congratulations to Jack Wilson for winning this Drobo! Working in VFX requires a powerful computer with reliable & secure backup. I have the computer part under wraps not so the other part. Make my wish come true! With a home network, tons of pics, videos and youtube videos I could really put this to great use. Thank you for the chance to win. I need a Drobo because, being an amateur photographer, I have way too many photos, not too mention videos and music. My main harddrive literally has less than 2 GB free right now. I need a drobo because I take all my photos in RAW and they take up a lot of space. However, I also need to protect them against hard drive failures. I need a drobo to back up all of my digital files! Wedding videos, pictures, important documentations, and all of my digital existence for the last 10 years. I need a drobo because my laptop storage always seems to be dying, so i need a safe method to store all my important files. I need a drobo so all my digital files can be back up and not worry about losing anything. I need a Drobo to safely store and protect my home based business important documents and data! My father had a 320 GB external hard drive that failed and it had a ton of old files of sentimental value to us. We tried several things in an attempt to extract the data but to no avail. I still lug it around in the freezer with me :) Anyway, it sounds like a Drobo would be quite useful in preventing something similar from happening in the future. This is the first I’ve heard of the device and will probably look into it regardless. I need a Drobo to sleep at night; safe in the knowledge that all my important files are tucked in near me, cozy and secure! I need a drobo to backup the many gigs of photos I have of my twins! I use and need a Drobo for continual backup of my photography and personal/business files. It is an excellent system for onsite, simple backup and recovery of your most important files. I have owned a Drobo for the last 4yrs and could not be happier with it’s performance. Pretty much like most others, my storage needs are larger than my current capacity. I enjoy movies, photography and nonlinear digital editing. NEED MORE ROOM. I am covered up with data. Music, movies, photos, stuff, stuff, stuff (didn’t George Carlin address this?). I need a place to consolidate safely and be accessible for all of my machines & devices. I want a Drobo for central place for all my data. I need to win because my current pc isn’t backed up, so if anything were to happen I would be SOL, and I would like to load movies on to the Drobo and stream them to my other gadgets. Drobo is exactly what I need to store all of the great content from Livid Lobster! I could use the extra storage space afforded by a drobo to consolidate my multiple drives worth of family pics and videos and to sho off cool technology that I always talk to others about! A Drobo is the perfect solution to my storage problems. I am constantly losing things because I am so disorganized! I really need a Drobo as a way to back up my files from clients, occasionally they need me to update old projects so they have to stay safe. 3D files also take up huge amounts of space. I need to store all episodes of GeekBeat TV! A drobo would be the perfect storage solution for my pictures and home movies! Drobos are awesome! I’ve wanted one for a while, and it’s great that you’re giving some away! Keep up the great work on the live show/podcast/blogs/etc! This would be the perfect storage solution for a business that my girlfriend and I are starting up. Would also be nice as a way to stream music and movies for personal entertainment. Just had a RAID box totally fail due to one bad drive and was down for a couple weeks trying to recover data that wasn’t lost. Looks like Drobo is the solution. I need a Drobo becauseâ€¦ Well, I have SEVEN USB-SATA boxes on my desk! I am a small business technology specialist. I have installed many Systems and many Sans Storage Devices. None are easy when it comes to RAID. All miss the mark with true off line Storage abilities. I am interested in finding out more about Drobo and how Drobo works. and Partnered with Products like Carbonyte or other off site storage partners. I’d use the Drobo to increase the energy efficiency of my home storage solution. Right now, I have a full-blown server running 24/7 just to store files…using a Drobo would be significantly more power efficient. My home server hard drive is clicking, will need to replace the drives soon. I have 4 2TB drives storing home movies, photos, and computer backups. I need a drobo to connect to my home server and provide an easy way of adding more drives as I’m already hitting the limit of my home server. Only 1TB left I’ll need to upgrade soon and my PC case only has 1 more HDD slot. I need to have a raid to backup my current server drives. Right now if they go, I have no way to backup that much data. I’m part of an amateur production group and we have alot of music and files to keep backed up. 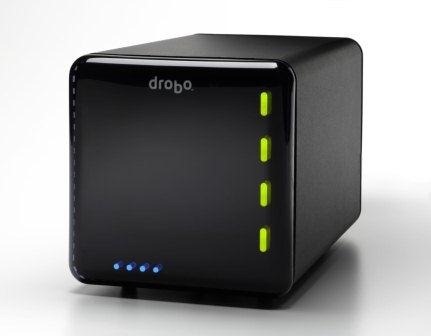 We’re looking for a raid solution and the drobo is the best bet. Seriously, we’re looking at my wife going to jail for murder if I don’t have a good backup of our kids movies and pictures. Haaaaalp!!! With 6 people in the house, data’s everywhere and hard to access on our PCs. I need a Drobo to help centralize and backup everything from media to shared documents! I really need a drobo unit cause my current storage system just doesn’t have the capacity that I desire. With a drobo unit that accepts up to 3tb drives I would likely be able to hold all of my data for at least another 6 months to a year. I have known Drobo since Geekbrief. Drobo seems to be the best so far in terms of robust backup solution. I would love to replace my lacie with Drobo and store all our family photos/videos and stream them over the network on either our Xbox or PS3!! I need a drobo because I have about 400 GB of photos that I would be devastated to lose! I’m a hobbyist photographer, so my photos are my life! I really really really need a Drobo because of my large video collection. Right now I have it all backed up on multiple harddrives and its just a pain. A drobo would allow me to get backed up and even give me some RAID goodness. I would like a backup for my home with 4 laptops and going to have more. I would like a central backup and are unsure of internet backups and would prefer a local backup option for all laptops in the house. Need a simple and safe storage solution. The Drobo would handle my large video and photo library which I’m constantly adding to. I have years and years worth of photos and video scattered about my network and I would love to be able to consolidate these with a Drobo! Having a Drobo would be nice because I do a lot of experimentation with virtualization, and need more space for all of my development environment VMs.